Markland Wood is a residential neighbourhood located in Etobicoke, in the City of Toronto, Ontario, Canada. It is bounded by Etobicoke Creek to the west, Elmcrest Creek to the east and surrounded by the Markland Wood Country Club. 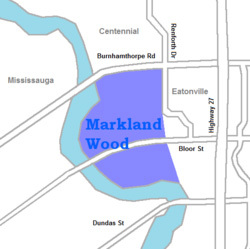 Markland Wood is the western-most residential community in Toronto along Bloor Street West, which cuts Markland Wood into approximately 1/3 to the south and 2/3 to the north. Markland Wood is part of the Etobicoke Centre riding for federal and provincial governments and Ward 3 for the municipal council. In 1810, John Silverthorn purchased 400 acres of rich soil east of the Etobicoke Creek and built a home he called Mill Farm. A year later, he and his son, Aaron, constructed a saw and grist mill that operated 24/7 and could cut 10,000 feet of lumber a day. By 1870, Aaron was a full-time farmer and the mill was leveled. His nature-loving son, Newman, bought up the land around Mill Farm and, before his death in 1918, stipulated in his will that no living tree in the 200-acre forest could be cut down by his heirs. In 1958, the Silverthorns sold the land to developer Marc Cavotti, and together with a number of other builders, started putting up houses. To preserve the area’s natural beauty, Mr. Cavotti asked potential homeowners to sign a contract that they would preserve any trees on their property. Today, Markland Wood is awash in greenery, charming solid brick homes, and residents who simply can’t get enough of each other. The Markland Homes Association was formed in 1962 to “Create, Foster and Maintain the Community Spirit in Markland Wood”. The MHA publishes The Marklander Newsletter the oldest, continuous running, community newspaper in Toronto. It was first published in 1962 and now has 10 annual issues delivered to MHA members’ households. Once you arrive, you rarely leave. Empty nesters who winter in Mexico, still live in their original home or have moved to the Masters condos overlooking the golf course. Their kids — now professionals in their 30s with tots, nanny and cottage — have bought the family home and renovated it to Yuppie standards and jog and walk dogs along the 2.5- km circular Markland Drive. Click here to view additional Markland Wood Properties.